The multi award winning all-new Mazda MX-5 is the lightest MX-5 since the iconic original, the all-new Mazda MX-5 is shorter, lower and wider than the Mk3 it replaced. With the smallest overhangs and lowest centre of gravity yet, its dynamic proportions and Mazda’s KODO: Soul of Motion styling reflects its focus on driving pleasure in an unmistakably contemporary and dynamic way. The roadster is available with a choice of five trim levels, from the base SE model up to Sport Nav, and the options of either the 1.5-litre or 2.0-litre petrol engines with six-speed manual transmission. SE-L models with the 2.0-litre 160ps engine are distinguished by 17-inch Gunmetal alloy wheels and piano black door mirrors, and benefit from a strut tower bar and limited slip differential. Step up to Sport trim and both the 1.5 and 2.0-litre cars feature rain sensing wipers, rear parking sensors, smart keyless entry, Premium Bose® Surround-Sound and heated leather seats. The All-New MX-5 Sports Recaro is now available with a limited number of 600, this stunning edition comes with beautiful Recaro sports seats that complement the red stitching throughout the car with a Alacantra dash panel, Alloy pedals and limited edition floor mats, This model also comes with Piano black side skirts, splitter and rear spoiler finishing the Sports Recaro off perfectly. 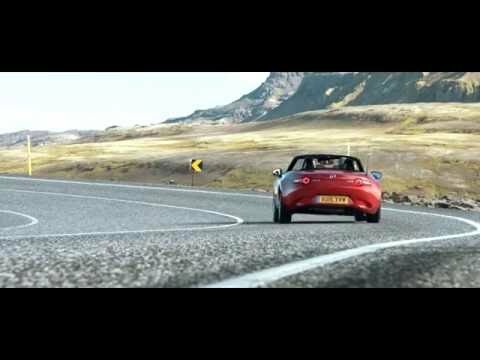 Mazda MX-5 boasts thrilling rear-wheel-drive combined with lightweight SKYACTIV Technology that ensures uncompromised fuel economy, 0-62mph in just 8.3 seconds and fuel economy up to 47.1mpg.